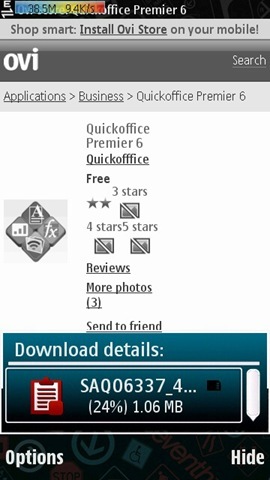 Angry Bird, Spiderman, Quick Office showing free on Ovi Store? Operator billing coming to India? Update: It seems that Nokia has removed all the paid apps from Ovi Store for a while, but still the damage is done and is counting more as even the genuine buyers not able to buy any app from Ovi Store since a day now. Definitely, Nokia gonna have a hard time explaining this to developers. I and many other users have asked from @NokiaIndia and @ovibyNokia, but still no answer from them and their twitter account is silent over all this. I was about to go for the evening tea break and all of sudden a tweet of @freak4mobiles hit me. 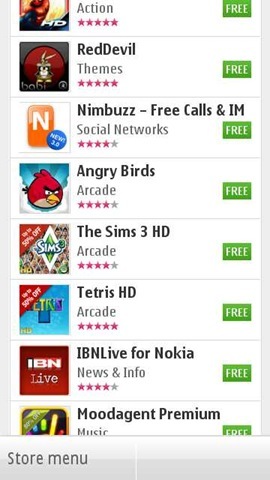 He told that all of the big game titles are showing as free items in Ovi Store of his Nokia N8 at least. It was a news that was too good to be true but still I touched the Ovi Store icon on my home screen and whoooaa… this was true. 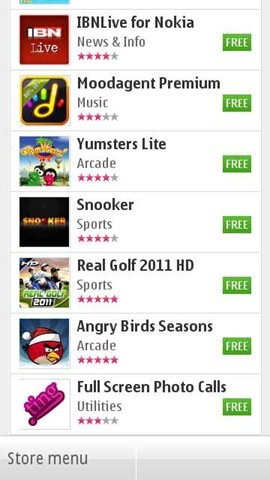 Not even games but everything was there for free like Nokia has gone into Santa mode post Christmas. I was like what’s this? Even if Nokia might have gone this much generous for a while, the various App developers wont allow this and if something such was going to be happen then we blogger would have known the same earlier via developers, but nothing such was in air. 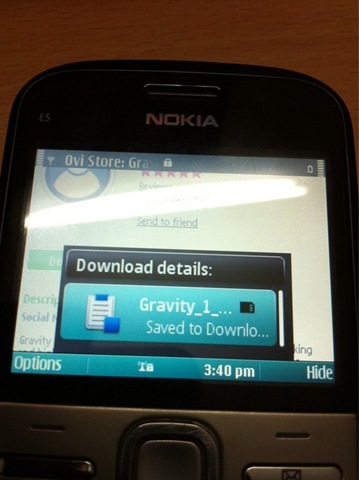 I tried to download via Ovi Store client on my Nokia N8, but this was showing download error again and again. So, this was sure a glitch in system. My best guess is, they are testing the Ovi Store model that will go along with some new version of Ovi Store that might be in pipeline and could appear in coming firmware update Nokia devices. 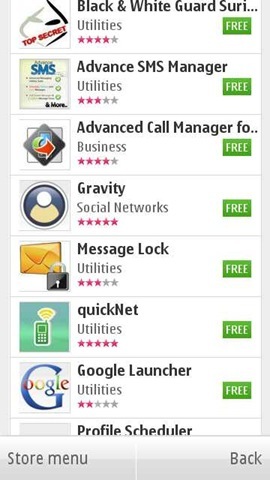 My buddy @vyomashar confirmed first that for Nokia E72 users too that its showing free on their sides too. Update 1: Just got an unbelievable update from @jainrounak. He was able to even download apps for free via Ovi Store on his. he even provided some of the screenshots as well from his Nokia E63. 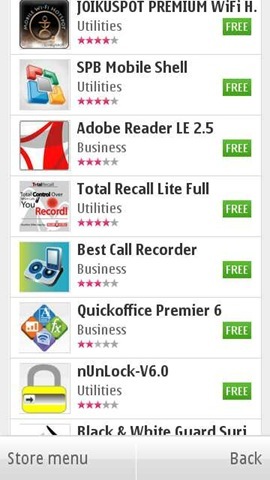 @sirajsoft also added the trick that if you go via store.ovi.mobi then you can download anything for free. He tried that on Nokia E5. Below is the screenshot. 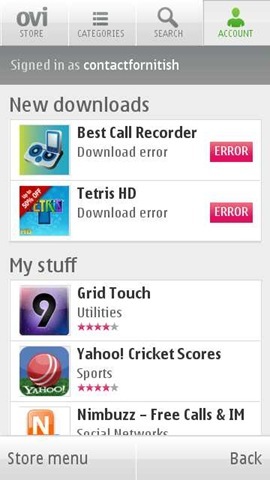 I tried the same but at least for Symbian^3 owners like me, its redirecting to Ovi Store App only. For platforms like S60 V3, S60V5 quitting from Ovi Store application and continuing with Mobile version store.ovi.mobi doing the trick. I went to Store.Ovi.com to check the same and found this. This was definitely something new, if I am right then prices were never showing as Rs. earlier. Is this has something linked to last day event? Unlikely, but this seems to in line of our continuous requests from Nokia to bring the operator billing concept to Indian market as well or at least to show the prices in Rs. rather than alienating users by showing prices in Euro. I am sure that users gonna be more easily convinced to buy big games like Angry Birds, Spiderman Mayhem HD in just Rs. 75/-, who can entertain them for long with a price equal to only one plate of meal. Will not this be easy to convince people now to buy an application like Gravity that can make you socially super productive in just Rs. 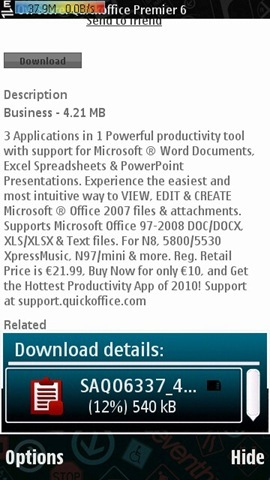 150/- or business apps like Quick Office Premier 6 in Rs. 150/-? Prices in Euro were seriously not helping to n00bs. Its mentioned there mate. I am also about to add a screenshot of the same error. Previous Previous post: Upcoming Symbian^3 updates, what and when?